We're back again in 1964, for the sixth serial of Doctor Who's first season. The main cast is the same as in the two shows from this era I've covered already—the tetchy old First Doctor, schoolteachers Ian and Barbara, and the Doctor's teenage granddaughter Susan. And the stakes for the travelers are mostly the same as well: They're wandering randomly through the universe in the TARDIS, and the question that comes up most commonly when they land is "how are we going to survive this?," not "what wonders will we see now?" That's certainly one of the driving elements of tension in "The Aztecs," in which the TARDIS crew find themselves stranded in pre-Cortez Mexico, and must survive in a culture whose religion is based on human sacrifice while trying to get back to their ship and escape. The Doctor isn't a hero here in any conventional sense—all he's really interested in doing is figuring out how to open the one-way door in the tomb of the recently deceased high priest Yetaxa atop the city's main temple, where the TARDIS had the bad luck to land. But this is really a story about Barbara—possibly her best in the series—as she's mistaken for the divine reincarnation of Yetaxa and decides to use her newfound power for more than just her own safety, but to put a stop to human sacrifice. Ignoring the Doctor's insistent advice, she takes the bull of history by the horns and tries to make it go down a different path. She fails, and her failure has a certain Shakespearian flavor to it—the moral of the story here is that a single person, even one temporarily mistaken for a demigod, stands as much chance of transforming an entire culture as Lear does of asserting his royal power in the face of a raging thunderstorm. Adding to that Shakespearian air are the two priests who become respectively the major ally and enemy of Barbara and the Doctor. The decent Autloc takes Barbara's new message to heart, but pays a Lear-like price for re-examining his faith and his morals; she destroys his career, and he wanders off into the jungle alone. And the scheming Tlotoxl (played with show-stealing gusto by John Ringham) conspires against Barbara with the nasty zeal of Iago or Richard III, including the unnerving habit of gesturing at people with the knife he uses to cut out people's hearts. In the historicals, the Doctor and his friends were meant to be little more than visitors, seeing the sights and meeting the people but making no significant changes—abiding by the tourist's credo to take only pictures, and leave only footprints. The official line at the time was that it was impossible for the Doctor to change history. 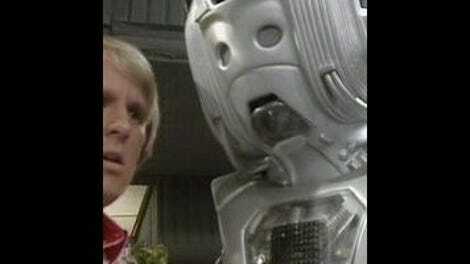 Script editor David Whitaker (in a letter quoted on the DVD's infotext) said this pretty plainly: the Doctor "cannot interfere with [time] in any way whatsoever. He cannot divert it, improve it or destroy it. The basis of time traveling is that all things are fixed and unalterable. Doctor Who is an observer." (Whitaker bent the rules to allow the Doctor's interference only in "the personal histories of certain people from the past … provided that they are not formally established as historical characters.") I think that's a questionable assertion even for the Hartnell era, and it was certainly rejected by later eras of the show—but I'll get into that aspect in a moment. First, though, I'll point out that the historicals in general, and this view of unchangeable history specifically, put some severe restrictions on the kind of story Who could tell. For one thing, it can't really be very science-fictional. There are also no aliens, no monsters, no timey-wimey stuff in "The Aztecs." Indeed, the TARDIS is literally locked away for nearly the entire story. (And if Hartnell's Doctor had carried a sonic screwdriver, it would have needed to be sidelined as well; no magic wands, and no spacetime wizards.) The most advanced pieces of technology seen otherwise are Ian's flashlight and the wooden pulley the Doctor carves to help them raise the temple door. Even though it's a story in which Barbara contemplates trying to change the course of an entire culture, "The Aztecs" is grounded in simple realism in a way that today's Doctor Who would never even bother contemplating. Has the show lost something important by leaving this kind of story behind? I'm not sure; I kind of don't feel that they're that big a loss, as much as I liked "The Aztecs." You don't really get a story like this on any other show, but as a fan, I'd much rather see a proper Sontaran/Rutan war than a return visit to historical realism. BARBARA: If I could start the destruction of everything that is evil here, then everything that is good would survive when Cortez lands. The Doctor's adamance ("Believe me, I know!") suggests that before meeting Barbara (or us viewers), he had also tried to change history and also failed catastrophically. I'm pretty sure that Lucarotti meant this to be taken at face value, as a warning from the Doctor that history cannot and should not be tampered with. 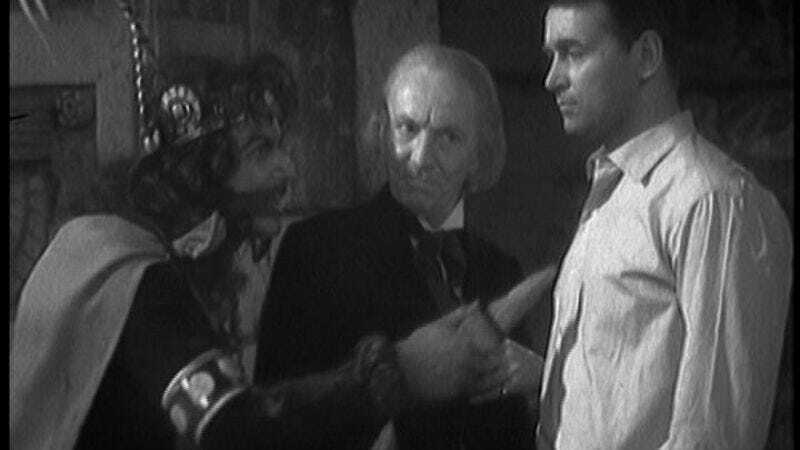 But seeing this scene now, with decades of subsequent Who history filtering it, my takeaway is simply that the First Doctor had not yet figured out how to change history into what he wants it to be. Because the thing is, unless he lives in a completely deterministic clockwork universe, the Doctor changes history every time he opens the door of the TARDIS. You know the saying about how the wings of a butterfly can create a hurricane halfway around the world? In terms of that metaphor, the Doctor is Mothra. There's a longer discussion about this point that I've been saving up for "The War Games," but there's a good argument to be made that these early years of the show only make sense in the light of later continuity if you believe that the Doctor of the black-and-white era only thought that he was a renegade and fugitive. The idea is that the Time Lords were secretly in total control of the TARDIS, sending him wherever they wanted so that he could interfere in history and change it according to their plan. This concept isn't necessary to enjoy or understand "The Aztecs" on its own terms, of course, but it's worth keeping in mind because it's the (mostly unspoken, and thus 99% canonical) guiding principle by which Who's most influential writers framed the Doctor's relationship with his homeworld during the Third and early Fourth Doctor period. These days, of course, the show fully embraces the idea that time can be rewritten—and has drastically and permanently changed the Doctor's own timeline at least twice. The idea that the history of the series has in fact been repeatedly overwritten and erased may actually be the only way to resolve many of the inconsistencies that have crept into the show over the years. But maybe that's a discussion for another time, like when I get to writing about "Genesis of the Daleks." The question becomes, are they unable to change history because history really can never be changed, or is it just because the writers say they can't? There's a powerful metatextual reason for that rule, namely that the viewers need the in-show history to stay close enough to reality that we can still relate to it. Of course, it was easier to keep this problem off the table in the Hartnell era simply because the Doctor was not the superhero he's become today—the man some call Inspector Spacetime. He couldn't tow a stolen planet behind his ship, or reboot the universe with a wedding-day wish. He was just an irascible and arrogant old man who was often too busy trying to save his own neck to worry about anyone else's. And his companions were just as frail and powerless. Barbara's scheme dooms Susan to horrific torture that they are only able to save her from by fleeing. (Although Ian the science teacher is unexpectedly badass here, showing no particular fear at having the city's best warrior out for his blood, and apparently having learned the Vulcan neck pinch several years before Spock debuted it). It's notable that many of the plots of these early shows, "The Aztecs" included, revolved around the main characters simply trying to figure out how to safely get back to the ship so they could get the hell out of Dodge, and solving other people's problems as a bonus or even by accident. But the Cameca/Doctor relationship is also a precedent-setter for why there weren't many more of them, because it's pretty clear that the Doctor just isn't boyfriend material. Oh, he clearly likes her, but their friendship sprang out of his selfish personal interest in getting back to the TARDIS. I got the distinct impression that even after he did realize how she felt, the Doctor was only stringing Cameca along because she was still useful. Hartnell's nonchalant delivery of the line "yes, I made some cocoa and got engaged" is a self-effacing joke to Ian about what he's gotten himself into, full of wry irony but lacking in sentiment. Even before the final episode, he's clearly planning to just leave her behind in Mexico. (Though he does, in the end, take her gift to him as a final memento.) So maybe she gets off easy—she's one of the first friends he coldly abandons, but she won't be the last. • If you're wondering about the fact that a color photo leads this article when the show was filmed in black-and-white, it's a screenshot of a production photo shown on one of the DVD extras. • One of the most intriguing things about Tlotoxl, and a major reason "The Aztecs" works so well dramatically, is that for all his conniving ways, from his perspective he's right: Barbara really is a false goddess, intent on desecrating the things he considers holy. • "How do you know he was hit from behind?" Well, the wound on the back of his head would be a giveaway, wouldn't it? • Oct. 16: "Terror of the Autons"
• Oct. 23: "The Talons of Weng-Chiang"
• And then after another Three, Four, and Five, we'll return Six and Seven to the rotation. Exact episodes TBA, but possibly including "Inferno" and "City of Death."